Emmersyn Fiorentino is one of the adorable stars of the hit Netflix comedy series A LITTLE HELP WITH CAROL BURNETT. In each episode, Fiorentino and her child co-stars banter and babble with the television legend– Burnett in an effort to help solve life’s problems for special celebrity guests. 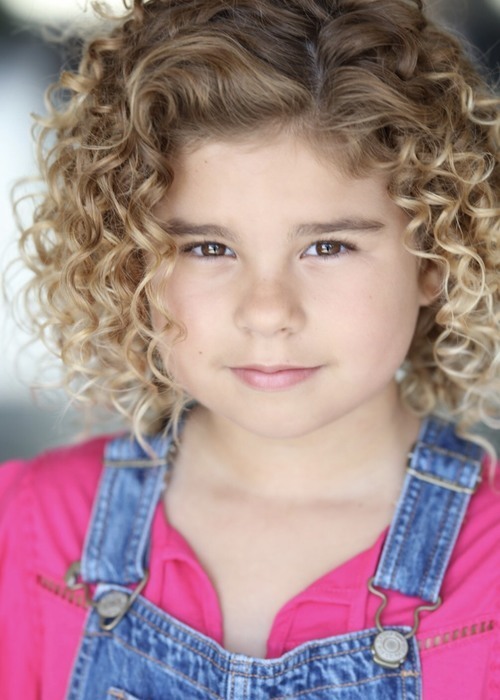 No stranger to television, this curly blonde talent has recurred on Disney’s LIV & MADDIE and guest starred on NBC’s LIKE FAMILY & GOOD GIRLS, Disney’s BIZAARDVARK’S and Super Deluxe’s FUN HOUSE. She has also appeared on CBS with Jane Pauley on NEWS SUNDAY MORNING and with James Corden on THE LATE LATE SHOW WITH JAMES CORDEN. Not stopping with the small screen, the soon to be 9-year old cutie has had supporting lead roles on the big screen. Film credits include THE WAY YOU LOOK TONIGHT, FUN MOM DINNER, STRANGE MEN, DESI’S ALBUM and LONG DISTANCE. As a child of the cyber age, Fiorentino has worked extensively on inter-net programs including Nickelodeon’s ORANGE CARPET: THE EMOJI MOVIE, Tastemade’s, KITCHEN LITTLE WITH RICHARD BLAIS, the BuzzFeed projects BRAWNEY TOUGH DAY PEP TALK, SCOTCH BACK TO SCHOOL & MOTHER’S DAY MOVIE PROMO and Funny Or Die’s LITTLE REPUBLICANS. She has also starred in the PSAs FOR THE CHILDREN and ELLIE THE ELEPHANT for PETA. When not working, Emmersyn is a typical kid hanging out with her family in Southern California. She enjoys dancing, rock collecting, dolls, arts and crafts, swimming & snorkeling, animals, hula hooping, origami and her trampoline and bicycle. Emmersyn Fiorentino may be a tiny little gal but her talent is huge and she is definitely one to watch!